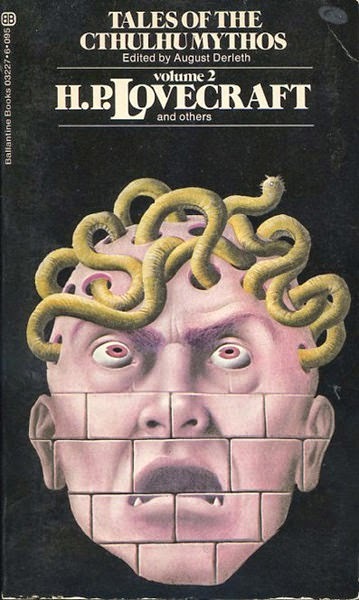 After weeks of delay brought about by travel, cataracts, other obligations, and, above all, laziness, I finally finished Mysteries of the Worm by Robert Bloch. 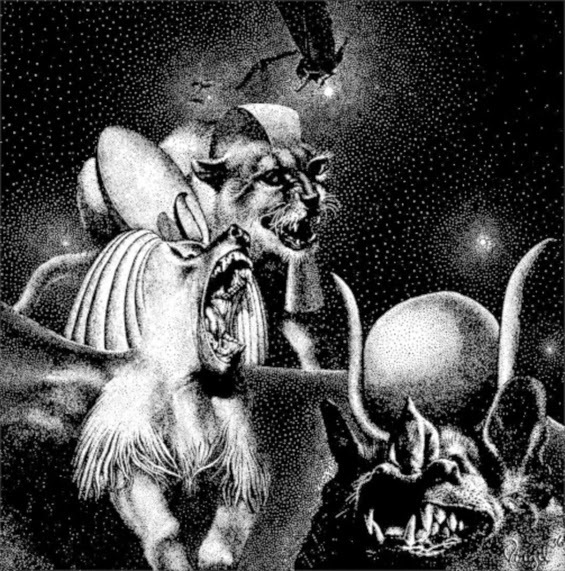 It's name is the English version of Bloch's contribution to the Mythos' library of evil volumes: De Vermis Mysteriis by Ludwig Priin. 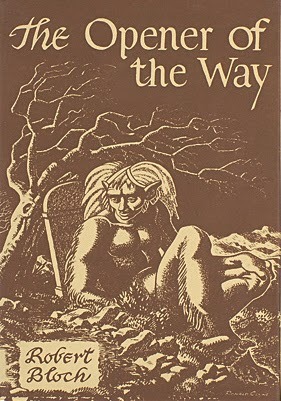 As edited by Lin Carter, it originally appeared in 1981 from Zebra Books. Both later editions had a few stories added by our hero, Robert Price, and were published by Chaosium. 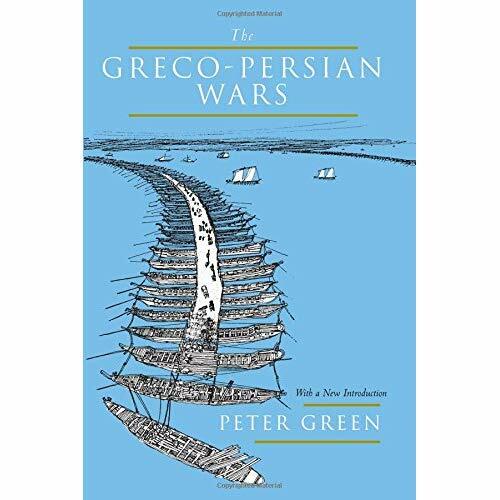 I've read the 2nd edition, depriving myself of four more bits of Mythos writing. He wrote most of the stories in the collection before he was twenty-two. Some barely rise to the level of story, really being nothing more than a nifty idea but lacking much in the way of plot. Only a few are great, the rest being the work of a novice writer. And I don't care. There's more atmosphere, more thought, and more originality in almost every one of Bloch's stories than any of those I struggled with in Lin Carter's Xothic Legend anthology. Bloch was still a teenager and there's an intimation that he will be a better storyteller someday. With Carter's stories, it's evident that he had reached his limits. 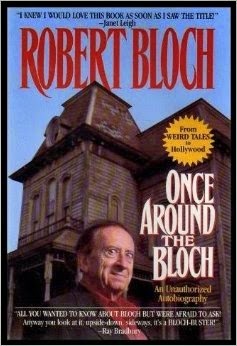 Robert Bloch (1917-1994) is still, sadly, really only known to the wider public (if at all) as the author of Psycho. Even that laurel is faded as it's Hitchcock's movie that people know best. Apparently he only merits a mention in the recent film, Hitchcock, about the creation of the movie. What most people don't know is that he started his writing career as a sixteen year old member of the Lovecraft Circle. He had written to HPL in hopes of securing copies of older stories that were no longer available. HPL not only sent him copies, he also encouraged the young Bloch to start writing. Later, Bloch started writing suspense and horror fiction that was more psychological and less supernatural. That path led to Psycho which ultimaltely seems to have led to Hollywood. There he wrote tons of TV scripts as well as several films. Several of Amicus Productions dynamite horror anthologies were written by Bloch. Asylum remains a favorite of mine. And he never stopped writing original fiction. 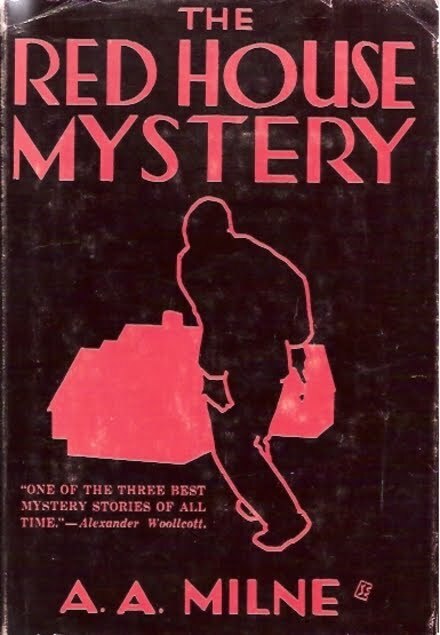 His last novels, Psycho House and The Jekyll Legacy (co-written with Andre Norton), were published in 1990. But there are no real tomes of mystery or actual myths and legends to the Lovecraft Mythos notes Price. The stories we are reading by Carter, Bloch, and others are what really compose the Mythos. As such, while Bloch's creation, De Vermis Mysteriis by Ludwig Priin doesn't actually exist, Price believes Carter's decision to title the collection after it is perfect, stating "The stories of the Mythos are the Mythos!" It's a line of reasoning I like. Other than that, there's not much further exploration of the theory Price put forward in The Hastur Cycle, that the "true" Mythos is something that preceded and extended past HPL's own stories. All Carter wanted to do when he created Mysteries of the Worm was to get a bunch of stories he loved by a member of the Lovecraft Circle together in one place. In his "unauthorized" autobiography, Once Around the Bloch, Bloch wrote that as he had few ideas and no style of his own, when he started he tried to emulate his idol, HPL. And that's what you get in much of Mysteries of the Worm. These are pulp stories, most written for Weird Tales. You can practically smell the ink and cheap paper as you read them. There's an audio clip of Bloch explaining how he would start with a finale for a story and then work out how he got there. It's easy to imagine him doing that in many of these stories. In one story, a man kills himself but the knife he uses is revealed to have the fingerprints of a gigantic ape. In another, a man learns his friend has been strangled by the little monster living on his back. In "Notebook Found in a Deserted House", my favorite in the book, you get exactly what the title describes. All cool ideas that Bloch must have had fun working back to the beginning. So what to make of the actual stories? For all the rough edges and unsurprising surprises, the earliest stories still have a nice zip to them. While he was trying to emulate his mentor, there's still a leanness to Bloch's prose that's similar to what he would develop as a mature writer. It's also easy to see that maturity starting to emerge over the course of the book. While Bloch mimicked HPL in the first story, "The Secret in the Tomb", by "The Secret of Sebek" from two and a half years later the narrator is self-aware enough to notice when he find himself talking old-timey all of a sudden. It's not that he's dismissive of HPL's more florid style, but that he's finding his own prosaic one. You can see the taut, more naturalistic prose that's the hallmark of his later thrillers and horror stories coming into being. Several of the stories are linked, not as direct sequels, but by an Egyptian theme. It first appears in "The Faceless God." Bloch plays with Nyarlathothep as a deity worshipped in ancient Egypt under the priesthood of the dark pharaoh, Nephren-Ka. The latter, as Prices points out, is presented as an evil doppelganger of the monotheist ruler, Akhenaten. Like him, Nephren-Ka was struck from all the histories and monuments, but for vile sins and depravities, not simple heresy. In the Egyptian stories, Bloch does desert adventure in "The Faceless God", dark secrets in the wild English countryside in "The Brood of Bubastis", and a riff on Poe in "The Secret of Sebek." As in all of Bloch's Mythos stories, the emphasis is on the pulp aspects of the whole enterprise. Bloch admits that his knowledge of historical Egypt was pretty lousy, but really, if there are enough animal-headed mummies and secret tombs, who cares? Much as some critics go on about the depth of meaning to HPL's stories, what brings most people in I would argue, are the monsters and madmen. 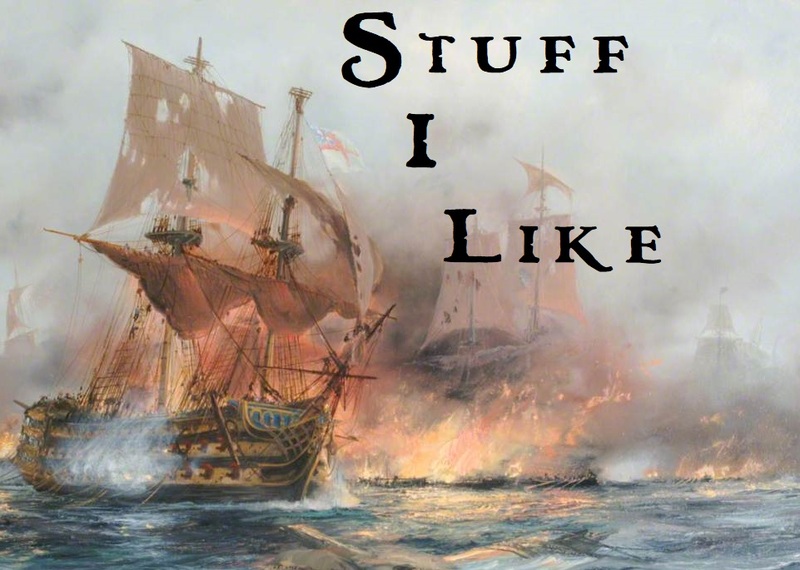 Sometimes, readers need to be reminded of this cobbled-together thing's roots. For all the brooding existential dread that permeates the Mythos, there's also a great sense of play present as well. There's a whole lot of meta-storytelling going on from the very beginning. HPL gave himself and his correspondents nicknames. Lovecraft put some of his friends into the stories and allowed himself to be used by them in turn. In "The Shambler from the Stars" Bloch portrayed HPL as a "mystic dreamer" from New England and killed him off. Lovecraft got his own back, killing off the Bloch stand in, Robert Blake, in "The Haunter of the Dark." 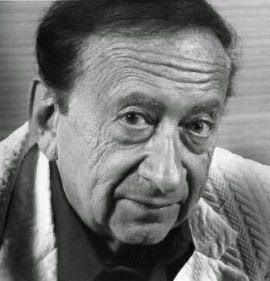 Bloch later wrote "The Shadow from the Steeple," a direct sequel to "Haunter." Both of Bloch's are pretty decent. It's a kick to witness the literary results of Bloch's and Lovecraft's interaction. They were hoping to write good spook stories, but they were in constant conversation with each other. What Bloch and Lovecraft did, killing each other off, is a lot more enjoyable than Derleth and Carter simply listing all the books from each other's haunted library shelves. As good, and as much fun, as Bloch's early endeavors are, it's two of the later stories that are the best in Mysteries. The first of these, and easily my favorite non-HPL Mythos tale, is "Notebook Found in a Deserted House." I first read it in theTales of the Cthulhu Mythos Vol. 2 with the creepy John Holmes cover. I was probably fourteen when I first read it and was glad to find it held up when I reread it last week. A boy goes to live with his aunt and uncle in the deep woods. Deep woods where awful things apparently lurk, hiding and waiting for dark and awful purposes. It's not a perfect story, with the juvenile narrator writing in his notebook right up until something smashes down a door (I hope you don't think I'm giving anything away by writing that. This is a Mythos story and you do know how they pretty much all end, right?). But there's a great, creeping feeling of dread and rising fear in the story that's terrific. The final story, "Terror in Cut-Throat Cove," bridges the gap between Bloch's more traditional Mythos stories and his noir-tinged non-supernatural tales. An American expatriate living on a Caribbean island is approached by an American couple to help out on a dive for a Spanish wreck. Things don't go well. These are not the finest crafted Mythos stories. The earliest ones suffer from clunky writing and derivative plots. But they breathe, there's life in them that many other Mythos writers never found. Bloch's skills developed quickly, and within a few years he was crafting well-written and clever stories that supply a nice jolt. Bloch never abandoned his love for HPL's creation. In 1978 he wrote Strange Eons. It's a goofy book that tells of the final rising of dread Cthulhu by weaving together incidents from HPL's own tales. It's not scary or disturbing, but it is a lot of fun. It was published by Whisper Press, an arm of the great and mighty Whispers magazine. 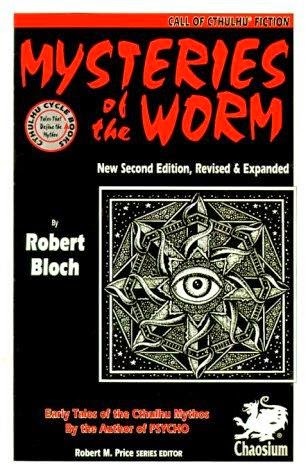 If you have any interest in Robert Bloch or Mythos fiction, buy yourself a copy of Mysteries of the Worm. I'll probably upgrade my copy to the newest edition in the future. 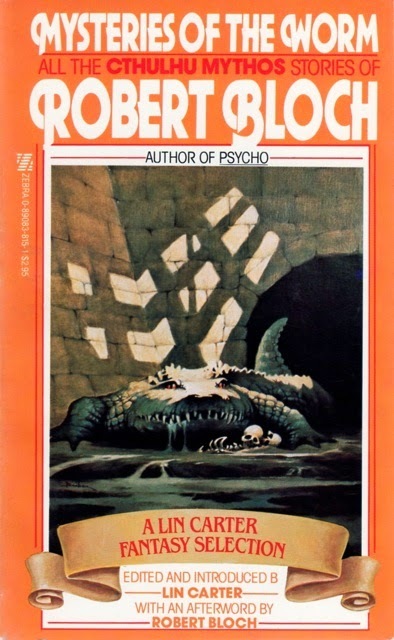 The Hastur Cycle is a collection with a more serious purpose (to prove Price's theory regarding the nature of the Mythos as a body of stories), and several stories that aim for loftier artistic goals than Bloch's, but that leaves that volume a little drier and almost academic compared to this one. This book is just much more fun, and, really, that's why I read these stories. Terry Pratchett died today. I thank him for nearly for literally dozens of very good, often great, books. If you haven't read him, or only a book or two, you should fix that problem. And it is a problem. 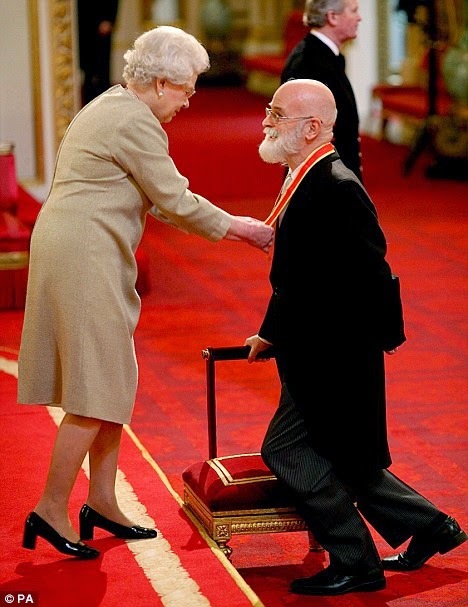 Despite the debilitating effects of Alzheimer's Disease Pratchett was still writing until very recently. Except for the last few books, there are no clunkers in the Discworld series. Some I like better than others, but all have moments that will make you laugh out loud. Even in the volumes I like the least he could still whip up characters and scenes that were moving. This from a man who wrote two or three books a year at one point. Thank you, again, and RIP, Sir Terry.